I do wonder at times why I find planting and tending vegetables so satisfying. Of course, there’s the psychological virtues of having one’s hands in the soil, the feeling of groundedness, and all that. If I refer to the bible I discover that Genesis has verses about the barren Rachel becoming pregnant as the result of surrounding herself with mandrakes, the humanoid-looking root plant. 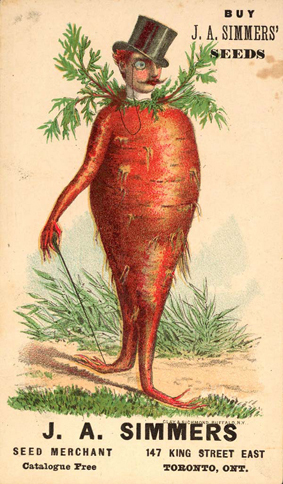 Conceiving children with the assistance of a mandrake is lovely, and all that, but the carrot seeds I’ve planted are sophisticated enough to hire tailors and ophthalmologists, and their conversations are filled with British 19th century prejudices. 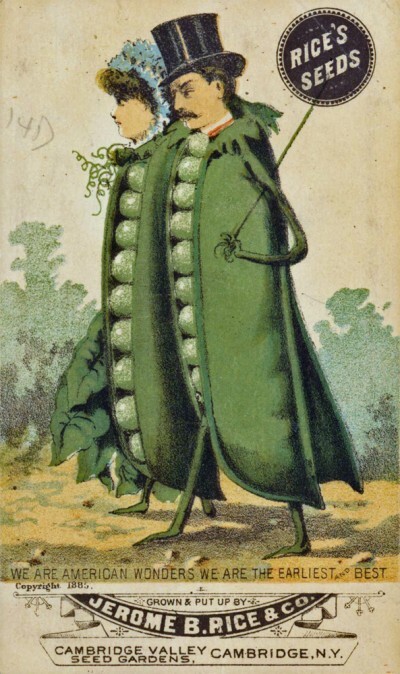 We at Process Media have an unseemly interest in anthropomorphic figures in commercial art, and now put out a call for collectors and experts on the subject. If you want to help create a book on the subject, please contact us at info@feralhouse.com.